We need to allow the connection between Windows and SharePoint directly. Open Internet Explorer [also known as IE] – (in this example IE 11 is being used). Press ALT and click Tools from the bar that appears. From the drop down box click Internet Options. Type the address of your SharePoint site into the bar next to the button “Add”. 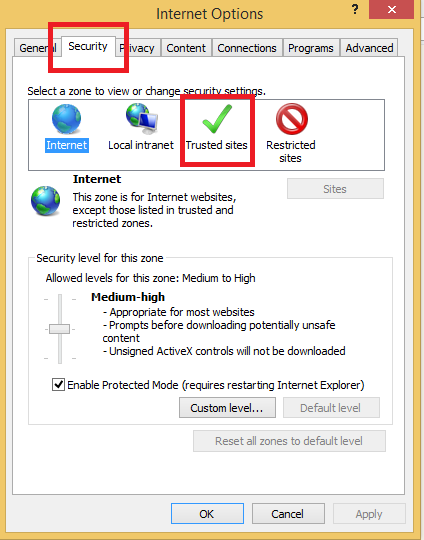 In Internet Explorer (only works in IE) go to your teams SharePoint site and log in as usual. Go to your shared documents and click the Library tab under Library Tools. In the section “Connect & Export”, click “Open” with Explorer. This will open another Internet Explorer window which you can drag and drop files into. When this has finished we strongly recommend that you remove the site from the “Trusted Sites” list for security measures. When you reopen SharePoint Workspace, it will sync the new data down from the cloud. We advise that you do not open SharePoint Workspace until it has uploaded fully and if possible please try to leave the PC alone while it Uploads/Downloads files from SharePoint. It can/may take a long time to complete this process depending on your PC specification and internet connection speeds. If you would be interested in using Cloud2020 to Upload data to SharePoint then please, contact us for more details. What version of Windows am I running (32 vs 64 bit)?